Inevitable I guess. When I started collecting there were at least three places in Philadelphia and now there are none, and NYC is down to one. We still have pen shows! 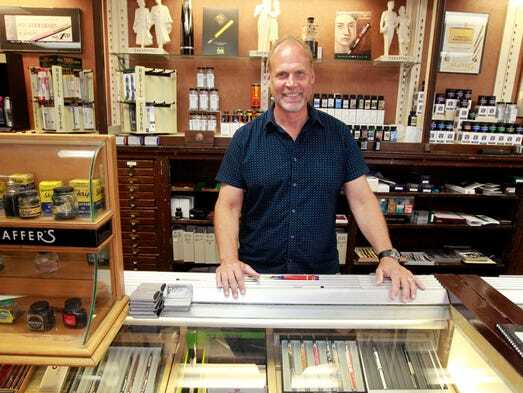 WAUWATOSA – Daly’s Pen Shop is something of a museum. It has custom-made cabinets dating to the 1920s; walls lined with old advertisements and photos; displays of vintage inks; and shelves stocked with pens that, with their gold nibs and gleaming barrels, could double as fashion accessories. It has Sinatra, Mel Tormé and Ray Charles on the stereo. What it doesn’t have is customers. Last Wednesday, there were three — all day. Daly’s situation is hardly unique. The number of pen shops in the U.S. has declined significantly in the last 20 years, in part as purchases have moved online, said Susan Bowen, associate publisher of Pen World, a magazine for enthusiasts.